Graduate programs offered by the School of Accelerated Degree Programs are specifically designed for the student with significant employment experience. Students are challenged to expand their knowledge with exercises, techniques, and instruments to update and reinforce learning and enhance understanding of difficult concepts. In addition, students continue to develop their analytical and conceptual skills by enlarging their perspectives and identifying a balance between theory and practice with regard to their particular areas of study. At the completion of the program, students will be prepared to contribute to their organizations' goals by effectively administering and developing resources. Throughout their programs of study, students will have opportunities to develop their communication skills, demonstrate workplace responsibility, use interpersonal skills, practice working within a team, and develop an appreciation of the importance of continuing growth and education with an emphasis on values-centered thinking. Students are encouraged to engage in speculative thinking and to develop original work and/or research in their major areas of interest. This work should be analytical rather than descriptive, demonstrating a distinct, defensible, methodological, and theoretical perspective. Central to the theory and practice of adult education is the ideal of the synthesis of knowledge. The School of Accelerated Degree Programs seeks to achieve this goal through the construct of the cluster. Clusters are comprised of a faculty member and approximately 12 to 14 students who meet for four hours weekly during an evening or weekend. Each student is enrolled in a group of three related subject area courses, called a cluster, that are, in many cases, integrated into one seminar. Three semester hours of credit are awarded for successful completion of each course in the cluster for a total of nine semester hours per cluster. The cluster provides students with an opportunity to explore basic subject areas beyond the confines of a single discipline. These cluster group meetings provide a collegial environment in which students present their work and share their learning. A major objective of this format is the development of knowledge synthesis, so students can expect their learning to be measured in a variety of ways: written and oral presentation, class discussion, research papers, group projects, and traditional testing. However, as is true of most higher-education programs, each professor determines how students are to be assessed and graded; therefore, tests and quizzes may be used to supplement papers and presentations as assessments of student mastery. Each cluster is limited in size to approximately 12 students. The cluster follows the quarter schedule and meets one evening a week for four hours, integrating related courses of study. The cluster begins with a first assignment, given to the student when he or she enrolls in the cluster. This assignment is due during the first class meeting. Subsequent homework assignments are delineated in the syllabus, and, due to the accelerated nature of the program, it is expected that a student will spend, at a minimum, twenty hours per week working on these out-of-class homework assignments. This time commitment may vary, however, depending upon the student’s level of expertise in a given cluster. A student in a management cluster, for example, who has worked several years in a middle management position, and who has completed a variety of corporate sponsored management courses, may, in fact, spend less time working on assignments for this cluster. An academic advisor is assigned during the graduate admission process. Students are required to meet in person with their academic advisor prior to enrollment in their first cluster, as well as for enrollment in their final cluster in the program, which serves as their exit interview. During the remainder of their time in the program, students have the option to either (1) meet in person with their academic advisor for enrollment advising, or (2) contact their advisor by email or by telephone for enrollment advising. During this advisor contact time, the academic advisor discusses degree and enrollment options and opens the student’s portal for online registration. Graduate students may enroll prior to the start of each quarter, or they may simultaneously enroll in both summer and fall quarters during the summer quarter enrollment period. They may enroll in both winter and spring quarters during the winter quarter enrollment period. Students may register themselves for classes through their student portal after it is opened by their academic advisor. Once the initial enrollment is completed, the academic advisor closes the student portal. If a student decides after the initial enrollment to make a schedule change or withdraw from classes, the student must contact the advisor again, who will open the student’s portal for the enrollment change. It is the responsibility of the student to schedule this contact time with the advisor and to complete the enrollment process each quarter. 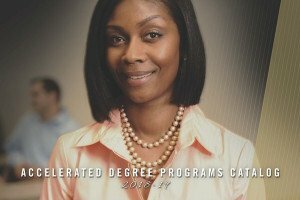 To receive a master’s degree from the School of Accelerated Degree Programs, students must complete a 48-hour degree program that typically includes five, 9 credit hour clusters and a 3 credit hour capstone course, thesis, or culminating project, depending on the degree program. Have a cumulative grade point average of at least 3.0 overall and in the courses required for the degree. Complete the objectives set forth in the program overview. Complete all practicum, apprenticeship, and residency requirements connected with the degree program, as specified by the program overview. Students are responsible for tracking their own academic progress and eligibility for graduation. Specifically, in order to track the progress through a degree, each student must maintain a checklist of all requirements, including major and minor requirements, general education requirements, free electives, number of courses completed at or above the 3000 level, and total number of credit hours completed. The academic advisor will confirm that all degree requirements have been met; however, ultimate responsibility for tracking the student's progress through a program and assuring that all degree requirements for graduation are met lies with the student. Only the Provost and the Registrar have the authority to certify that all requirements for graduation have been fulfilled and post a notification of degree completion on a student’s transcript. In addition to tracking their own progress through academic programs, students must submit an Application for Degree. The application must be signed by the student and the student’s academic advisor and be submitted to the Office of Academic Services. Failure to submit an application by the appropriate deadline may postpone the posting of the student’s degree. A graduate student is expected to complete a graduate program within five (5) years of the date of entry. A student who has previously earned a master’s degree from Lindenwood and desires another master’s degree type may transfer a maximum of 9 hours of credit from the first degree into the second degree if the credit is applicable. All other requirements for the second degree, including the culminating project or thesis, must be completed. 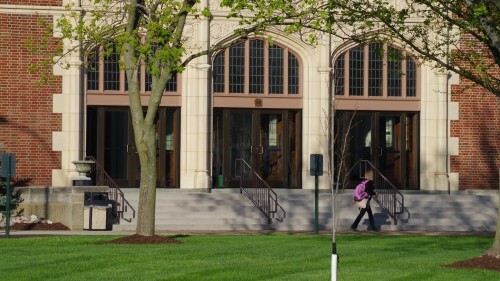 If the student is seeking a major leading to a degree type not previously earned at Lindenwood University the major will be added to the student's transcript and a new diploma will be received listing the degree and major earned. If the student previously earned a degree at Lindenwood University and is seeking a major leading to the same degree type the second major will be added to the student's transcript with the notation "Second Master's Major" but they will not receive a new diploma as no new degree type has been earned. A student who has earned a master’s degree from Lindenwood and desires another master’s degree type may transfer a maximum of 9 hours of credit from the first degree into the second degree if the credit is applicable. All other requirements for the second degree, including the culminating project or thesis, must be completed. A student who would like to pursue any additional master’s degree type beyond completing a second master’s degree will have to complete all degree requirements including the total earned hours for the degree program.